Facebook is very popular networking website and it hosts more photos than even photo sharing websites like Flicke, Photobucket. So, there ought to be an easy way to download loads of photos from Facebook. 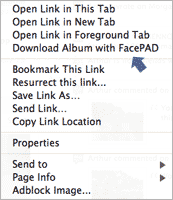 FacePAD Facebook Photo Album Downloader is a Firefox extension that makes this process real easy involving simple right click routine. Grab FacePAD Facebook Photo Album DownloaderÂ to quickly download photos from Facebook. It is easy and with easy access to lot of photos – fun part is always there!